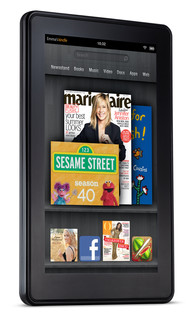 The already successful Kindle Fire may be having long legs well into the new year. According to analyst Robert Cihra of Evercore Partners, the recently released Amazon tablet will make up “50% of all Android tablets in CY12”, although he still expects Apple to be the leader in terms of overall profitability. Cihra even goes as far as to say that the Amazon tablet is the only tablet currently in the market that provides any sort of challenge to the iPad. Overall, Cihra has readjusted his sales estimates of Apple for the current quarter to be a bit less from his original predictions. He now sees 14 million iPad sales for Q1 2012, down from 15 million, due to the supposed iPad 3 or iPad refresh this March. Still, Apple’s profit margin is expected to be higher than usual at 41.1 percent because of the brisk sales of iPhones. The Amazon tablet marks the online retailer’s first foray into the tablet world. Although Kindle eReaders have been available since 2007, the Kindle Fire is the first from Amazon with a full-featured IPS screen, web browser, Android market accessibility and WiFi all in one device for a relatively low price of $200. Pre-order sales were reportedly higher than anticipated at north of 250,000 units.